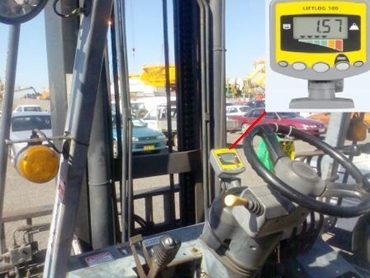 Electronic Forklift Scales were recently fitted to a Forklift at Newcastle’s new coal terminal in New South Wales. Supplied by Accuweigh’s Beresfield branch, the Electronic Forklift Scales are used to ensure goods being unloaded from vehicles are within the rated safe working load of the forklift. The weighing sequence for a box of unknown mass is for the fork operator to slowly lift the item until it is fully supported by the forklift. If at any time during lifting, the weight reading generated by the Electronic Forklift Scales exceeds the safe working limit, the operator is warned by both visual and audible overload warning alarms. Accuweigh ’s LIFTLOG Electronic Forklift Scales are a cost effective weighing and load monitoring instrument specifically designed for forklift trucks. The LIFTLOG 100 is very operator friendly and displays the live weight in a large LCD display which can be easily read in bright sunlight. Fully sealed to a waterproof IP67 rating, these Electronic Forklift Scales are fitted with a unique mounting bracket that allows fitting in any position. Accuweigh’s product diversity is exceptional and covers Weighing, Packaging, Food Inspection, Filling/Palletising/Wrapping, Onboard Vehicle Weighing and Truck Wheel Wash Systems – all fully backed by highly trained and experienced staff in eight branches across mainland states.